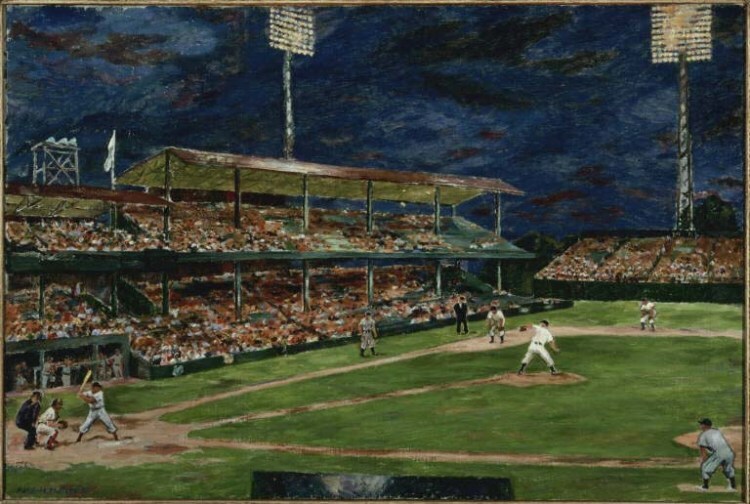 Marjorie Phillips painted Night Baseball in 1951, capturing an all American moment that was also so D.C.–the Washington Senators playing the Yankees at Griffith Stadium, a historic ballpark that stood at Georgia Avenue and W Street, NW, until 1965. This summer, the painting joins a selection of work by some 80 artists to tell the story of art in the district beginning in the 1940s. Washington Art Matters: 1940s-1980s is on view at American University’s Katzen Art Center through August 11. When you visit, you’ll recognize other works from the Phillips–Gene Davis’s Black Flowers (1952) and Augustus Vincent Tack’s Time and Timelessness (The Spirit of Creation) (between 1943 and 1944). The exhibition is accompanied by a free lecture series, co-sponsored by Art Dealers Association of Greater Washington, which aims to provide attendees with the skills they need to be art collectors themselves. Arnold Friedman, World Series, undated. Oil on canvas, 20 1/8 x 24 1/8 in. The Phillips Collection, Washington, D.C. Acquired 1938.
Who ever thought D.C. would have such baseball fever after the past few worse-than-lackluster seasons with our Washington Nationals? But this city was full of fans-in-waiting, and now you see red Nationals caps all over town. Will our team make it through today’s playoff game? Will they make it all the way to the Big Show? In a display of support (or premonition? ), we’ve hung Arnold Friedman’s painting World Series (undated) in a spot often held by Marjorie Phillips’s Night Baseball (1951). Duncan and Marjorie Phillips, true lovers of the game, would be thrilled at Washington’s display of baseball spirit. To celebrate our 90th anniversary The Phillips Collection held an all-day birthday party attended by 4,400 people. In honor of the event, my colleagues in the education department and I were asked to give half hour tours every hour on the special 90th anniversary installation of Renoir’s Luncheon of the Boating Party. The museum’s masterpiece is on display in its original location in a gallery in the Phillips family home, which was, when Luncheon of the Boating Party debuted there on New Year’s Day 1924, known as the Main Gallery. I thought it would be fun to reacquaint visitors with the Boating Party by describing what it would be like to view it in its original location as a form of time travel. I described the room as it looked then, with couches, rugs, ashtrays—in case anyone wanted to smoke—and a skylight. I let them know that in 1924 Calvin Coolidge was president, gas cost an average of 21 cents per gallon, Gershwin’s Rhapsody in Blue was first performed that year, and one of the year’s most popular movies was The Thief of Baghdad starring Douglas Fairbanks. Perhaps the most interesting bit of trivia about the historic year of 1924, however, was that Duncan Phillips’s beloved Washington Senators baseball team won the World Series—remember his wife Marjorie’s most famous painting Night Baseball(1951) featured the hometown team. The Senators took game seven from the New York Giants winning four games to three, when future hall-of-famer Walter Johnson came in to pitch relief in a 12 inning game. I don’t know if Duncan Phillips ever made the connection, but the year Luncheon of the Boating Party first went on view was the first year in baseball history that a major league team from Washington ever won the World Series. The Senators have become the Washington Nationals, but we’re still waiting for the second World Series victory. Was it a coincidence that the Senators won the World Series that year? I hardly think so.